Kaziranga University Recruitment 2018 September | Marketing Officer Post :- Kaziranga University has issued a recruitment notification recently in September 2018. According to the latest Kaziranga University recruitment 2018 September , Kaziranga University invites applications for the post of marketing officer to a walk-in-interview. The details are mentioned below. 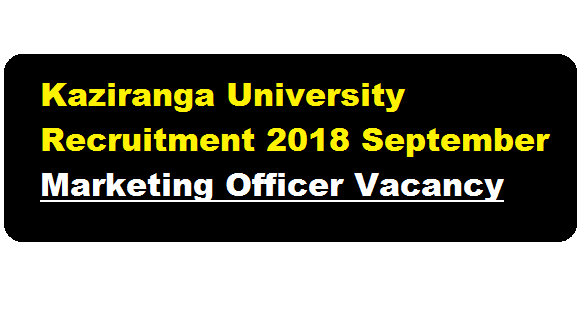 In this section, we will discuss in details about the recruitment of Marketing Officer Post under Kaziranga University Recruitment 2018 September with vacancy details, eligibility criteria, salary with other details and requirement. Eligibility : Any graduate or Post Graduate can apply for the post. Experience/Skills : The applicant should have good communication skills, basic knowledge in computer usage an fluency in English, Assamese & Hindi. Freshers are invited in the walk-in interview. Job Description : The applicant must be capable of undertaking relevant marketing and business development activities, off-campus office operations and must be willing to travel. The interested and eligible candidates may attend a walk-in interview. The interview timings and venue is mentioned below.